When I first began running, I was sure that I would never run farther than a 5K. Then not farther than a half marathon. Then no farther than a marathon. Then 50K was my limit. Then maybe multi-day stage races would be all I needed. Lo and behold, last weekend found me running through the night at mile 75 of a 100 mile race that I had sworn to all who would listen that I would never do. What went wrong? I don’t know, really. But I know that each distance in my running life has been about testing my will to go just a little farther. Part of it was to exorcise the demons of my “just good enough” adolescent sports years. Or my “average” high school and college grades. And my habit of sometimes just doing enough to complete a task with minimal pain and challenge. Then came running. No matter how fast or slow you run, you must go the entire distance. You must commit to the whole, to the end goal. To fail is to publicly admit to the world that, absent some injury or illness, I quit. I failed. So each distance in my running life has been about this. How much do I want that distance? The 100 was the brass ring. The ultimate test. You can’t fake a 100. You can’t train halfway and wing a 100. You can’t go out and just do a 100 without a great deal of planning and preparation. The 100 will eat you up and spit you out in a way that you’ll never forget. No, with he 100 you have to want all of the process, all of the training, all of the miles. This is why I found myself running a 100 on a moonlit trail in the middle of the night with only a few deer and one freaked out armadillo near me. For me, the race began after mile 50. The first 50 is a long day through the woods with many other people. After 50 all the 27 mile runners and 50-milers have finished. What’s left is the overnight hours, 50 miles, and your mind. The trail clears out and you find yourself alone in the dark with a headlamp with they eyes of animals whose homes you are invading reflecting the light from your headlamp. Adjusting to the night takes time. Your pace slows, small rocks and stumps become hazards. And it is inevitable that you start to do math. At mile 50 you are still lucid enough to make simple numerical calculations. This is the biggest mistake you can make, thinking about the whole. There’s nothing more dispiriting than feeling the accomplishment of the 50-mile mark only to realize that you have another 50 to go. I was warned not to look at the whole, to not consider how far I had left to run. Be in the moment, friends said. Be present. That was the hardest part of the race, staying cognizant of the moment and the mile I was in and not dwelling on the miles to come. (Well, that and the blister on the ball of my left foot that I ran on for the last 18 miles). Around mile 57 at the Heaven Hill aid station I told the crew there to make sure I savored all of this process. This is what I wanted out of my 100. There was something romantic to me about rolling into a late night aid station, getting encouraged from the folks there, and heading back out into the dark and on to the next location. That was the most romantic part of all this, the solo journey of a man on a mission to accomplish the unimaginable. But as fatigue weighs heavy and sleep seems so far away the doubts and the negativity enter the mind easily and push out the greater, more rewarding feelings from these races. It was a big moment for me to realize I was slipping away and to call for help. I didn’t want to lament for the rest of the race that I was tired and in pain. I wanted to know and to feel and to savor the experience. From afar this piece of bush looked like a tiny man standing next to another tiny man who kneeled on the ground. This was around mile 50. I can’t say enough about Heaven Hill. That aid station was a bright shining oasis that boomed music all through the day and night, that you could hear echo through the valley, beckoning you to push on and come refuel body and mind. The folks there got it. They’ve run these, they’ve crewed and paced these races. They met you at the bottom go the hill. They jogged you in. They lifted the soul. It was during the night, with many miles to go, and more than a little doubt rising in me that I implored them to help me. “Don’t let me not savor all of these moments. I want to remember and soak this in.” I wanted to leave this race knowing that I was there, in the moment, appreciating every step, every mile, every hour, every hill. And to their credit they reminded me. Even as I set off on mile 88, in the midst of the darkest period of the race for me, behind schedule, needing to run harder than I had all race just to catch up that Kyle Stichtenoth called out to me, “12 more to go. Savor them all!” That memory tears me up. And I have a thousand memories just like that. My friend Megan flew from California to pace and crew me, repaying my pacing and crewing her during her first 100 last November. You need a good friend who understands your running mind. She ran a tight ship. And she gave me a swift kick in the pants at mile 82 when our overnight pace had slowed such that if I didn’t get it together, I wouldn’t finish in time. We had talked to each other before each of our races promising that nothing we said to each other during the race would affect or damage the friendship away from the race. This is key. Because I was a crab and she had to get in my face. It worked. There were moments when I lost the desire. There were moments where I literally slept as I hiked through the woods only able to focus on her feet as they struck the path before me. If she hadn’t intervened I wouldn’t have finished in time to earn my buckle. Runners have to do the miles for themselves, but they will never be successful without good friends who understand them and the sport. My gratitude runs deep. Hustling for the last 18 miles gained my time back. I would finish with at least 20 minutes to spare. And as I reached the final approach, a red-clay road that started about 3/4 of a mile from the finish line, it hit me. A mixture of disbelief, of wonder; a surreal awareness that I would join a small group of people who had completed a 100 mile race in under 30 hours. Mary Jo and David Tosch (the RD) rang cowbells and blew a vuvuzela. My family cheered. Running friends who waited around to see me finish applauded and yelled. I didn’t want that moment to end. The finish line moment after a life-changing running experience can never be rebottled. You can try to replicate it in subsequent races, but it never feels like the first. Emotions made raw from exhaustion and success overwhelm you. These are the moments where we reify our ability to do more than we can ever imagine. In those times the failures of the past fade away and our soul is lifted by the realization that our limits are ill-defined by our mind’s inability to let go of pain and fear and just do the thing ahead of us. We have to force the mind to let it all go and just move. I had seen the literal and figurative darkness. I had struggled and overcame. I had been transformed. Things you think you see when exhausted during a 100: 1)a tree stump looked like a panda bear head. 2) A mossy rock was I thought for sure a sleeping duck. 3)My headlamp would shine on leaves and as I moved past so would the shadow, scaring me that some animal as running at me. 4)The pack of Coyotes howling all night long was slightly unsettling. 5) a rock formation with mud on it looked like an old woman standing along the trail. 5)For some reason late in the evening hours, I became fixated on the term “animal husbandry” for reasons I cannot explain. David and Mary Jo Tosch/Southeastern Trail Runs. 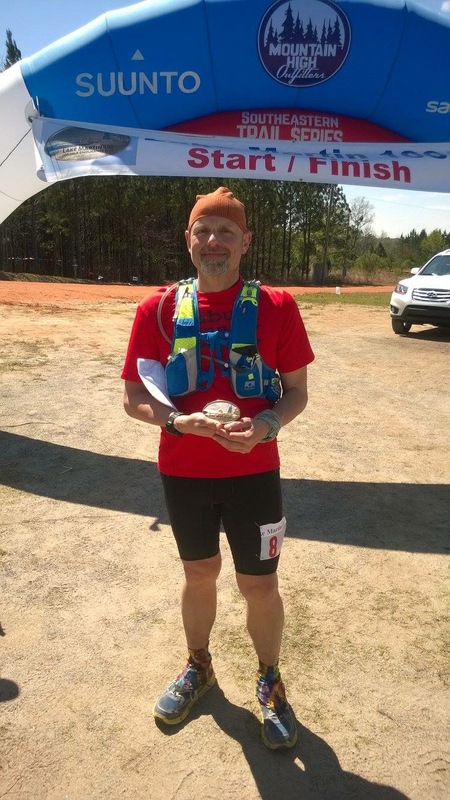 I’ve run more Southeastern Trail Run races than any other. David and Mary Jo Tosch are the gentlest, kindest, cheeriest souls I’ve come across in my running life. With a David Tosch race course you will earn your miles. They are rarely easy (even if he says so) and LM 100 was no different. Four 25-mile loops aren’t easy. And I think that hardest segment of the race is the last 7 miles of each loop. Running in a Tosch race is like being part of a loving family. I’ve jokingly complained about David’s infatuation with trying to build a course where you climb 100% of the time, but I’m proud to know these two wonderful souls and I’m proud that my first 100 was a race put on by David Tosch. Gear notes: Nathan 2L hydration pack, Buff headwear, Lululemon Short tights, Asics run shirt bought from Auburn Running Company in California. I rotated between the Hoka Challenger (last year’s model) and the newest Altra Olympus. My biggest mistake was changing shoes AND socks at mile 50. This would result in a major blister on the balls of both feet, especially my left foot which tormented me for 18 miles at the end of the race. The Altras caused blisters on the side of both big toes (something that had happened before but I had thought I had solved in training). This made me change socks and shoes at 75. I should have kept my socks and changed back to the Hokas instead of changing into a thicker Drymax sock which caused the big blisters. Next time I stay in the Hokas and get a solid sock that won’t blister me like the drymax did. (Funny, Drymax has always been good to me until this training cycle). Nutrition: Dates stuffed with almonds (2-3 an hour through mile 50), aid station fruit, and some skittles between miles 40 and 50. A PBJ every 25 miles. A tortilla with hummus, avocado and tofu at 50 and 57. I ate a Lenny and Larry’s Complete Vegan Lemon Poppyseed cookie sometime around mile 75. After mile 80 I lost my appetite. But I forced a tortilla, some oranges, a banana, and some candy and random gel into my mouth so I wouldn’t fall apart at the end. YES. I plan to do more 100s. Love that buckle!! I’m debating on this one. Thanks for the report!